The San Fernando Valley Goat Association's "Memorial Service"
Operation Crossroads was a series of nuclear weapon tests conducted by the United States at Bikini Atoll. They were the first nuclear weapon tests since Trinity (July 1945), and the first detonations of nuclear devices since the atomic bombing of Nagasaki (August 9, 1945). The first of many nuclear tests held in the Marshall Islands, Crossroads tests were conducted by Joint Army/Navy Task Force One, whereas the Trinity tests were conducted by scientists in the Manhattan Project in the Nevada desert. Image of Rita Heyworth as "Gilda" on Able bomb. Three bomb tests were scheduled to take place at the Bikini Atoll, the first code-named ABLE was used a bomb named “Gilda” after Rita Hayworth's character in the 1946 film, was dropped from the B-29 Superfortress on July 1, 1946, and was detonated 520 feet above the fleet. The second test was code-named BAKER and used a bomb named “Helen of Bikini”, and was detonated 90 feet underwater on July 25, 1946. A third deep water test, CHARLIE was planned for 1947, but was canceled. Some have said it was cancelled because the United States wanted to maintain their stockpile of fissionable material, while others have said that it was due to the United States Navy's inability to decontaminate the target ships after the Baker test. The purpose the Crossroads operation was to investigate the effect of nuclear weapons on a fleet of 95 target ships. Assembled in Bikini Lagoon, the fleet was hit with the two (ABLE and BAKER) detonations of plutonium implosion-type nuclear weapons. Both test incorporated animals to test the effects of exposure to the bomb and the resulting radiation. The ABLE test included a greater number and variety of animals for testing. 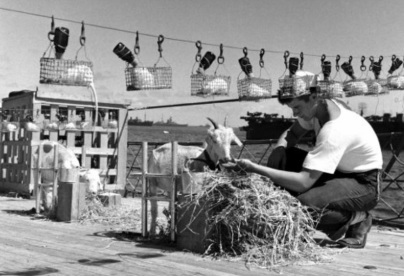 Hundreds of animals including goats, pigs, guinea pigs, mice and rats, had been placed on 22 target ships in stations normally occupied by soldiers, and were held in place by small frames and cages. Because ABLE was off its mark, producing a smaller explosion, and the spread out nature of the ships, the immediate blast killed about 10% of the animals. However, many more animals died days later from radiation, and a number of surviving animals were later killed as part of scientific testing. One little pig, named #311, managed to make it off of the Japanese test ship, named the Sakawa, and was later found swimming in the lagoon. The pig was later given to the Smithsonian's National Zoological Park, were it became a popular heroine of atomic survival, despite becoming completely sterile. In an article reprinted by multiple newspapers, the San Fernando Valley Goat Association announced a memorial service for the goats that died “complete with a eulogy, the lowering of the flag to half-mast, and the blowing of taps”. The association had protested the use of animals to Washington, however, unlike the animal rights protests that later resulted from Crossroads, it was largely meant to save property owned by members through the substitution of “pure-bred” goats with "’ordinary’ goats from elsewhere” (NYTimes). The BAKER test only used pigs and rats, but all of the animals died. The underwater explosion of “Helen of Bikini” created much more destruction than the previous test, and radioactive water sprayed the entire fleet. The Daily News. Perth, WA 18 July 1946. There were several negative effects on human life resulting from these tests as well. Bikini's native residents agreed to evacuate the island, and many were relocated to the Rongerik Atoll. Over years of testing nuclear and thermonuclear weapons near Bikini, it was declared unfit for subsistence farming and fishing, and determined to be uninhabitable. Also, many of the soldiers working on the test were in direct contact with contaminated water in the lagoon, and over the years have reported numerous health problems related to their exposure. Recently, the islands have been opened for diving and sport fishing, allowing people to search some of the remaining wreckage of the tests. Even if the contamination eventually fades, little will reverse the damage of the testing conducted over the years. During the arms race with the Soviet Union, the U.S. also tested thermonuclear weapons 1000 times more destructive than those dropped on Hiroshima and Nagasaki. As part of the Castle Operation, bombs such as Castle Bravo (a hydrogen bomb) actually left craters that have permanently changed the geography of the Marshall Islands.